Animal factory production restricts farmer liberties and profits, while allowing large companies to dictate policy changes that increase their market power. 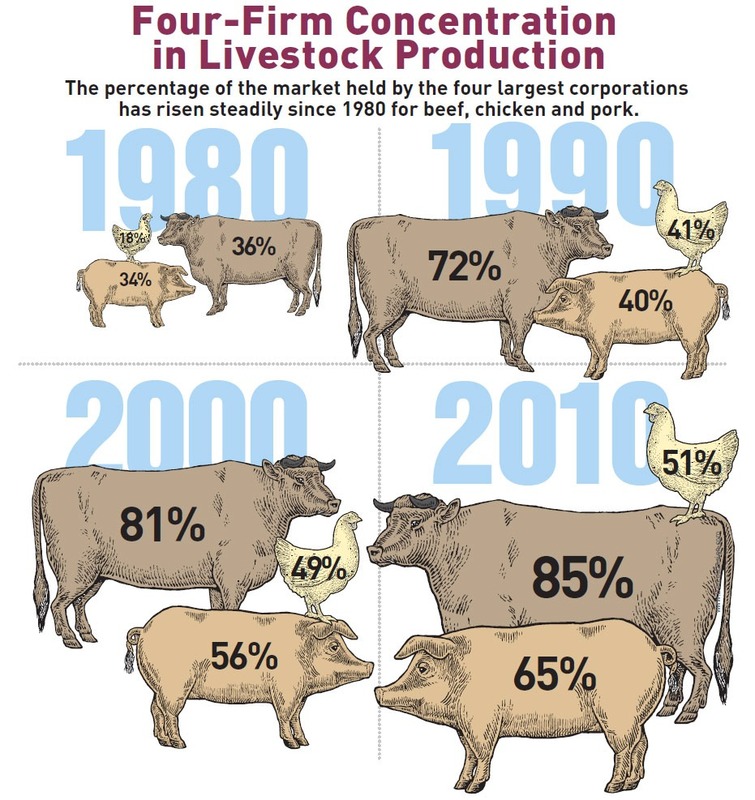 Corporate control over the entire supply chain in food animal production exploits the farmers actually raising the animals and leads to policies that privilege large-scale producers. Consolidation has contributed to the loss of nearly 5 million independent family farms since 1935. Many companies contract with farmers for their animals, profiting off their labor and investment while returning little wealth to the farmers. Contracts require farmers to use the specific feed provided to them. The farmers may not have access to information on which drugs or chemicals may be in feed. Farmers are forced to foot the bill for maintaining their facilities, including the huge costs of managing the large amount of manure, which can be in the millions of dollars and often puts farmers deep in debt. However, the majority of the money made selling the animal products goes to the corporation, not the farmer, leaving the farmer economically at the mercy of the company. If a company decides not to renew a contract with a farmer, it can destroy their entire operation and livelihood. Food corporations can devote considerable resources to lobbying government, influencing policies that favor large-scale production and disadvantage smaller farms. In 2016, the National Pork Producers Council spent $1.6 million on lobbying. “Right-to-Farm” laws, supported by large food animal producers, have been enacted to prevent communities from resisting the construction of animal factories. In 2010, meat trade groups spent nearly $8 million lobbying against and successfully cut funding for reforms that would strengthen farmers’ rights. In 2010, when Congress reauthorized the Child Nutrition Act, Tyson Foods spent over $2.5 million lobbying. The CNA reauthorization resulted in increased prevalence of meat and poultry in school lunches. In 2013, Tyson received nearly $90 million from USDA in purchases of chicken, beef, and pork for school lunch programs. DID YOU KNOW? Reducing overall consumption of meat and poultry proteins, sourcing certified humane, organic, and/or pasture-raised meats, and increasing portions of plant-based proteins in your diet can help support a diverse group of independent farmers operating at a variety of scales. Shifting land use from conventional corn and soy for animal feeds toward other fruits and vegetables could raise farm incomes by $336 million a year and generate 6,724 new jobs. Even with higher labor costs, organic crop farming can be 22 to 35 percent more profitable than conventional practices. One study found that organic broiler production, when compared to conventional, was more profitable for the farmer even with higher production costs . Another study found that organic agriculture and the use of community supported agriculture (CSAs) decreased the gender income gap for women farmers in the U.S.
Investments in biodiversity of organic livestock and produce farms reduce soil erosion, which decreases property losses.